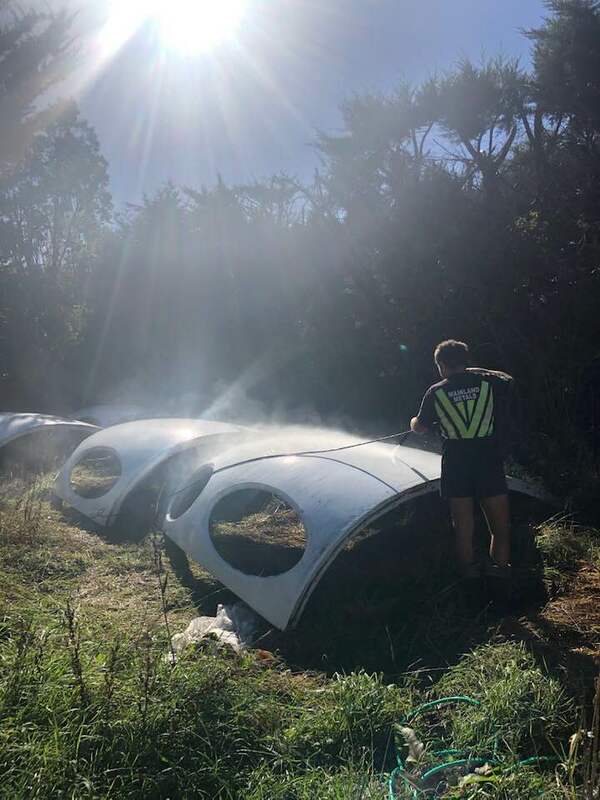 Nick McQuoid continues to make progress with his Futuros as documented in this series of photos posted to his Facebook page. The majority of the photos were posted 032319 and show the assembly of the lower half of one of the units. 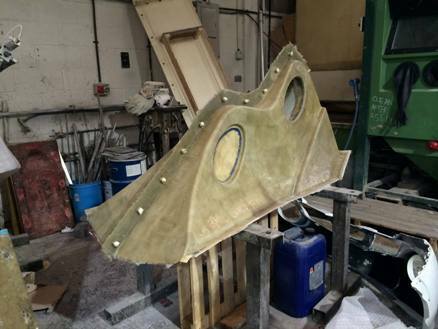 The final two photos were added 040819 and show upper body segments being cleaned in preparation for further assembly work. 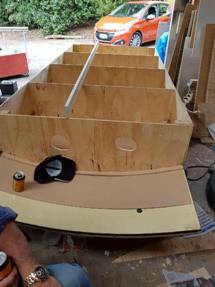 As he continues to work on his Futuros owner Nick McQuoid continues to document progress on his Facebook page. Most recently he added the video and photos below. 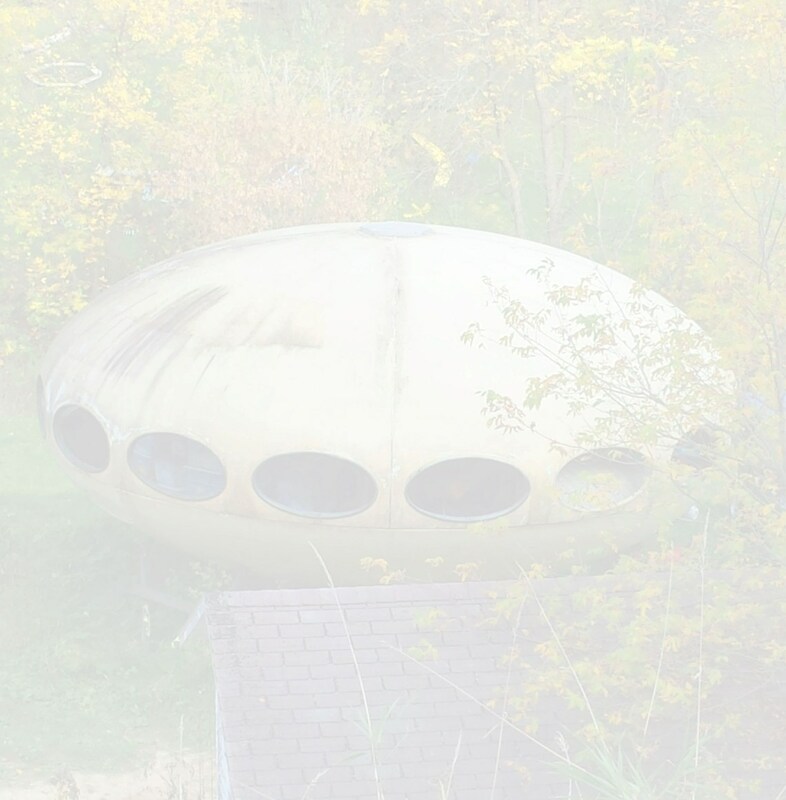 This video is embedded using the HTML5 Video tag but I have only tested in my current version of Chrome. 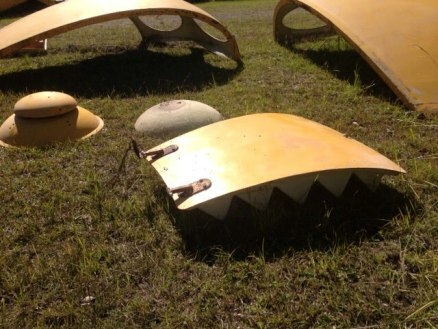 In other browsers/versions this may or may not function. If you are unable to view the video it can be downloaded from here for local playback. 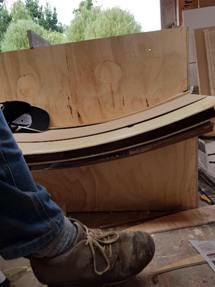 Nick McQuoid continues to work on his Futuros and to post interesting photos to his Facebook timeline along the way. 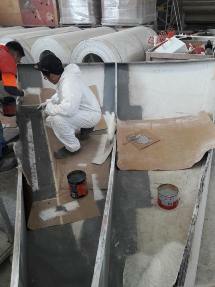 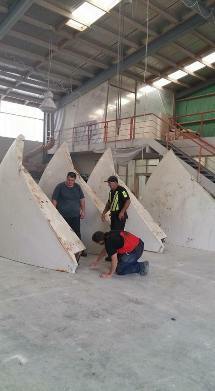 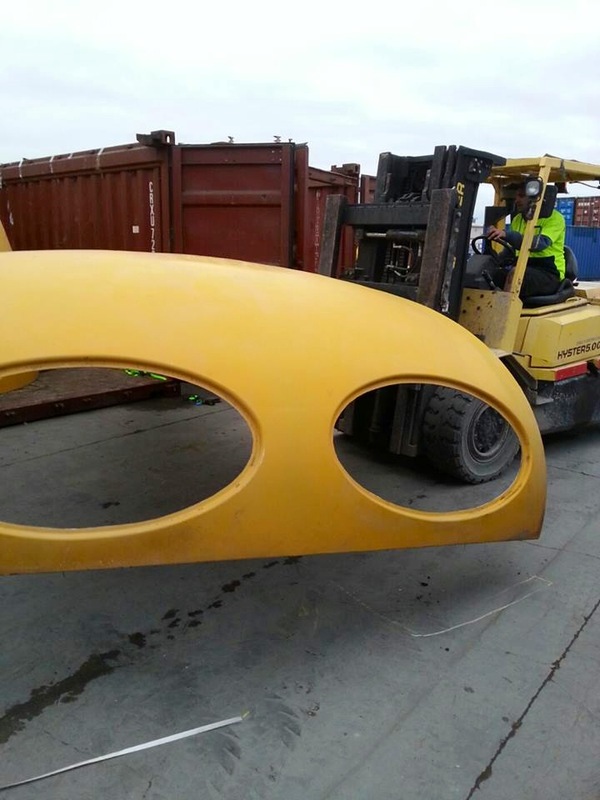 These photos showing Futuro sections "on the move" were posted 121417. 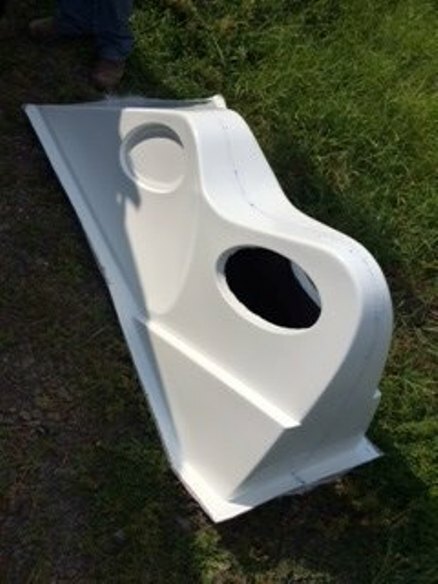 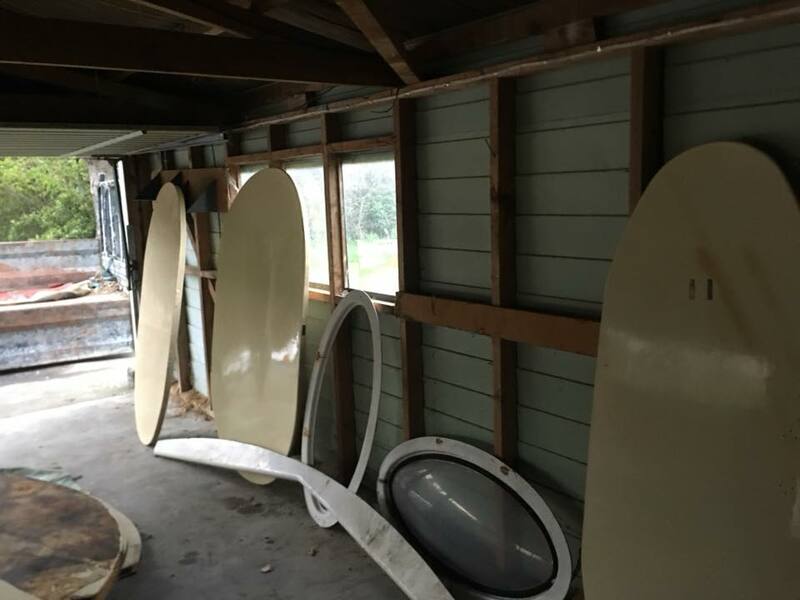 Nick McQuoid posted this pair of interesting photos to his Facebook page recently showing new fibreglass moulds that he has built so that missing parts for the Futuros he is restoring can be fabricated [internal components such as interior walls/bathroom fixtures]. 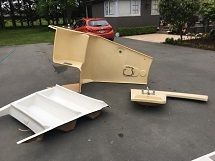 Owner Nick McQuoid continues to work on the restoration of his Futuros and he recently posted this interesting set of photos of various interior fixtures and fittings to his Facebook page. 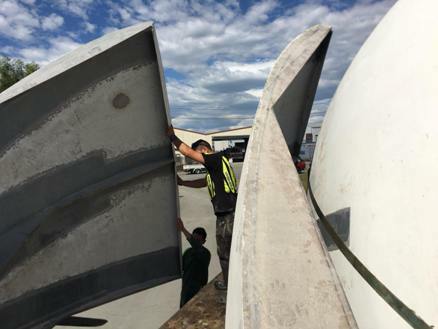 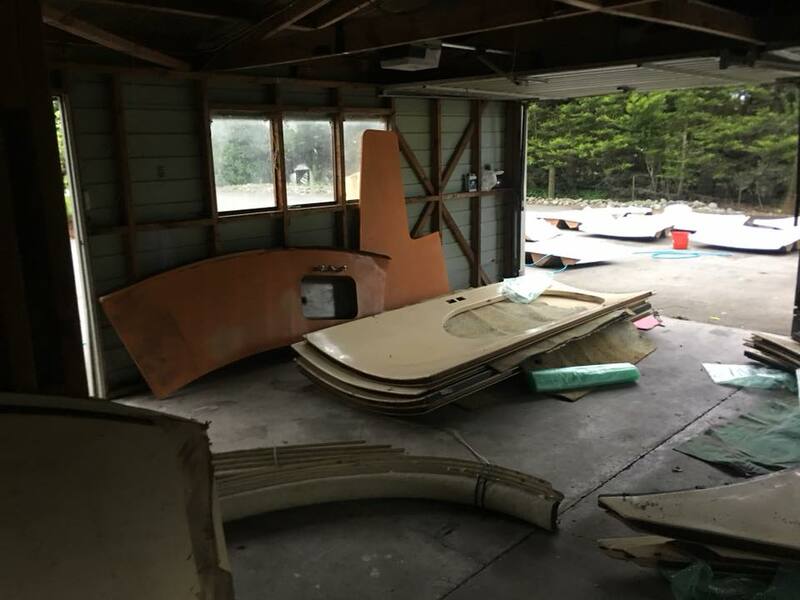 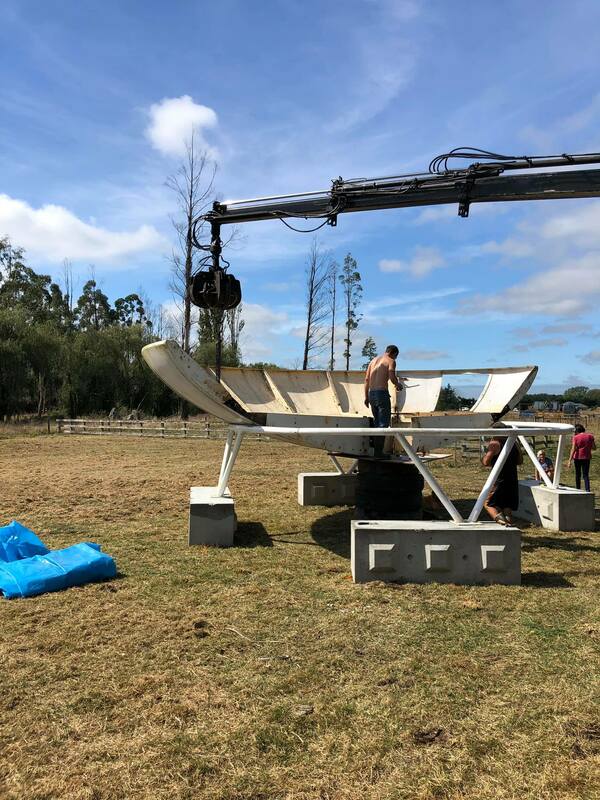 Always exciting to see progress on Futuro restoration projects and Nick McQuoid recently posted the two photos below to his Facebook page commenting that work is "almost done ready for rebuilding". Looking forward to seeing how everything turns out Nick! 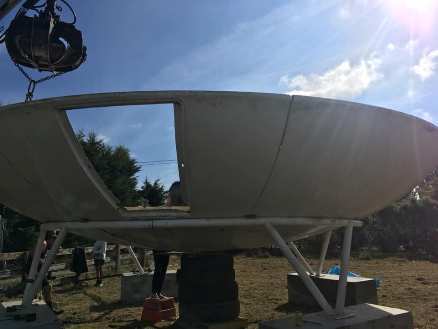 There have been a number of Futuro restorations over the last few years and for me following these restoration projects is always interesting. 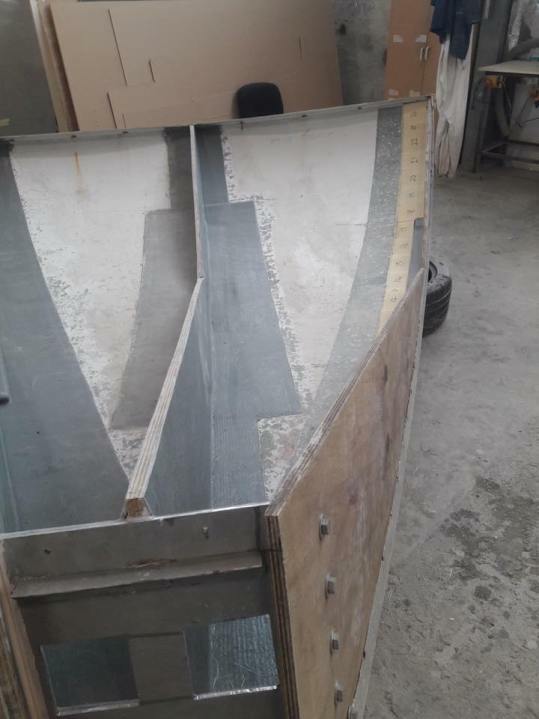 Owner Nick McQuoid shared the photo below of the support ring for one of his Futuros which was being sandblasted and then painted in a Facebook Post on 042016; another milestone in his restoration project. Nick had also previously had a support ring fabricated [see here]. 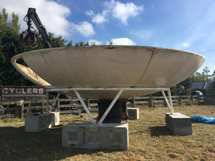 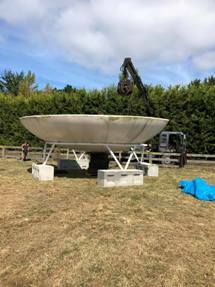 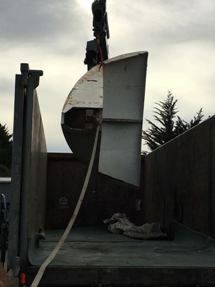 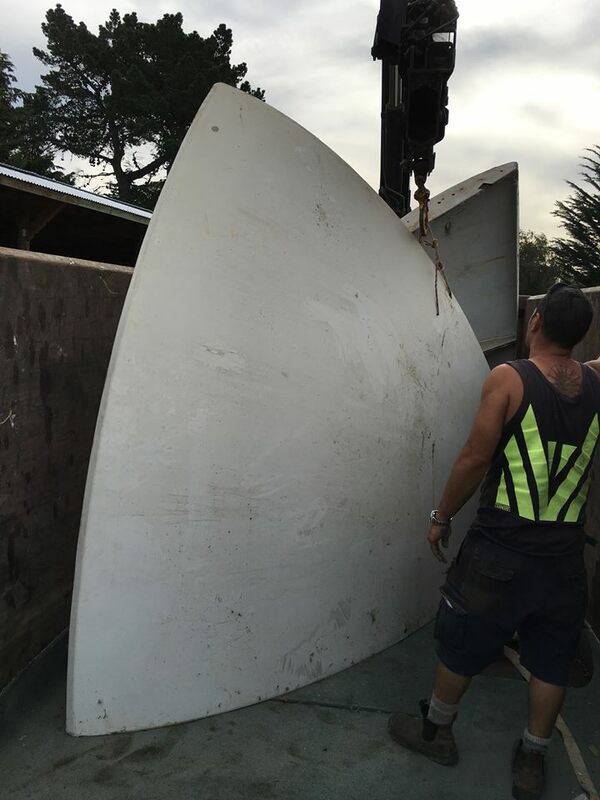 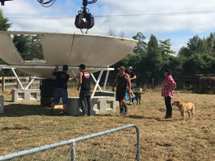 The Futuro that shipped from Australia clearly shipped with the support ring [see this photo] and certainly the unit previously located in Kaimaumau was mounted on a functional support ring when it was at that location [see this photo] so it is unclear why one had to be fabricated from scratch. 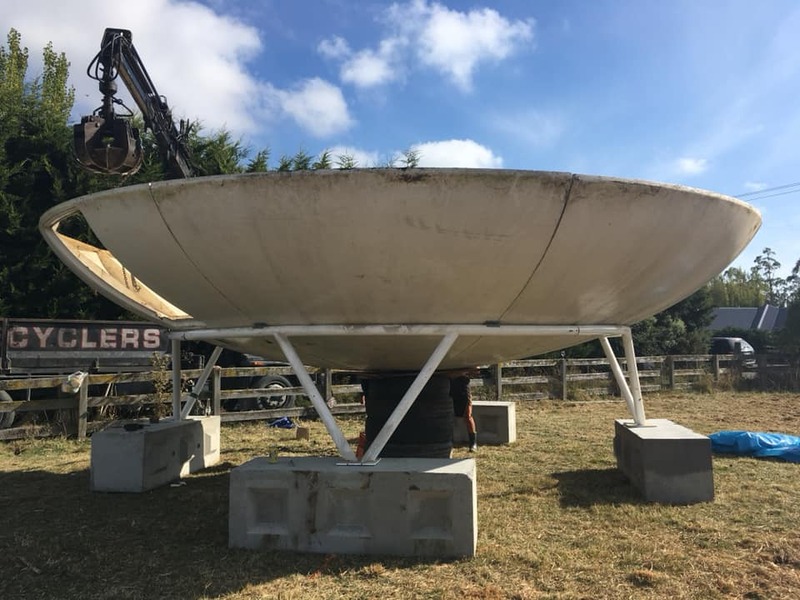 That being said given that the support ring seen below looks to have been yellow [and thus likely from Australia] my guess would be that the support ring from Kaimaumau was damaged significantly enough that a new one needed to be fabricated. Of course we all know where making assumptions gets you; no doubt at some point Nick will correct me if I am wrong. One of Nick's Futuros, the white one previously located in Kaimaumau, recently made the move to the facility where restoration work will be undertaken. 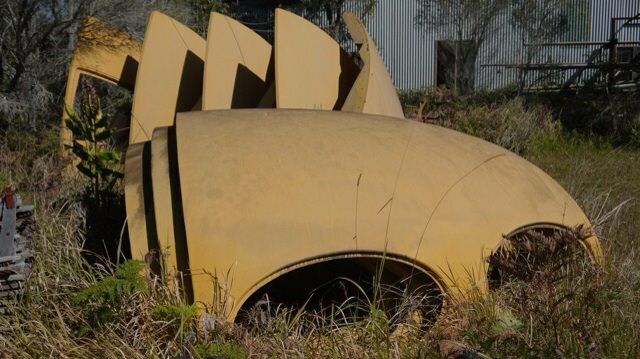 Good luck with the restoration Nick, looking forward to seeing how she turns out. This first set of four photos show the unit being loaded up for transport. 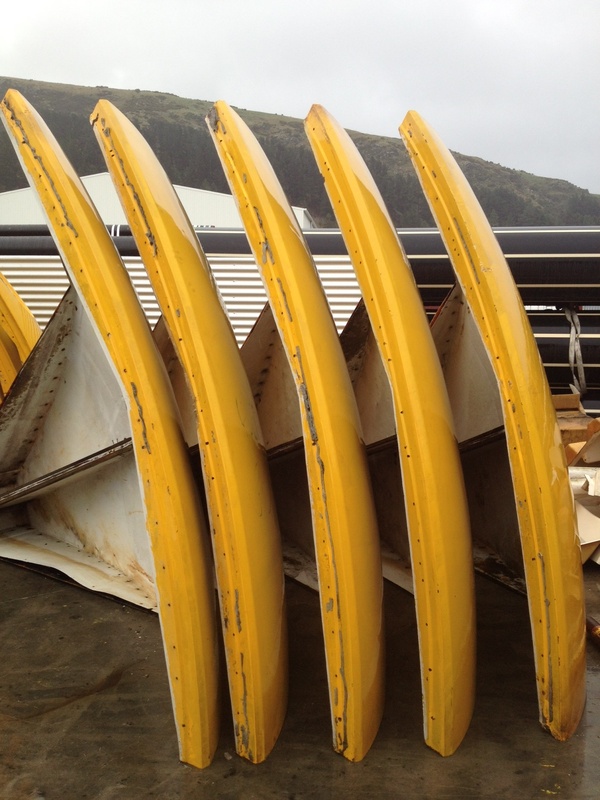 They were posted to Nick's Facebook Page 032216. 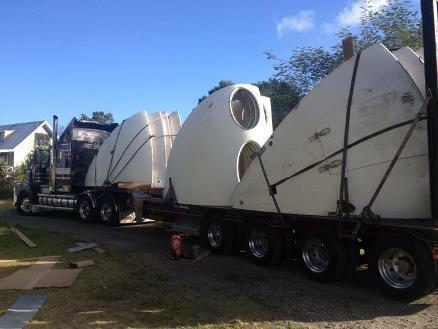 This second set of photos, posted the next day, show the unit arriving at the restoration facility. 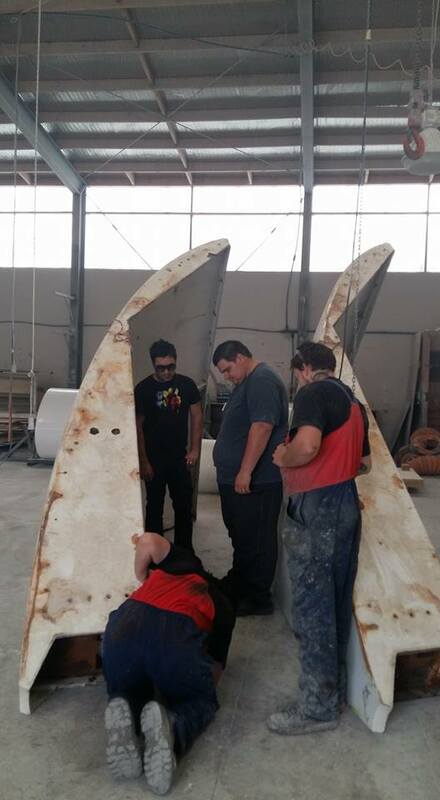 The three photos below are from Nick's Facebook Page and show the mold for making armrests, the mold and the first reproduction armrest and the armrest itself. 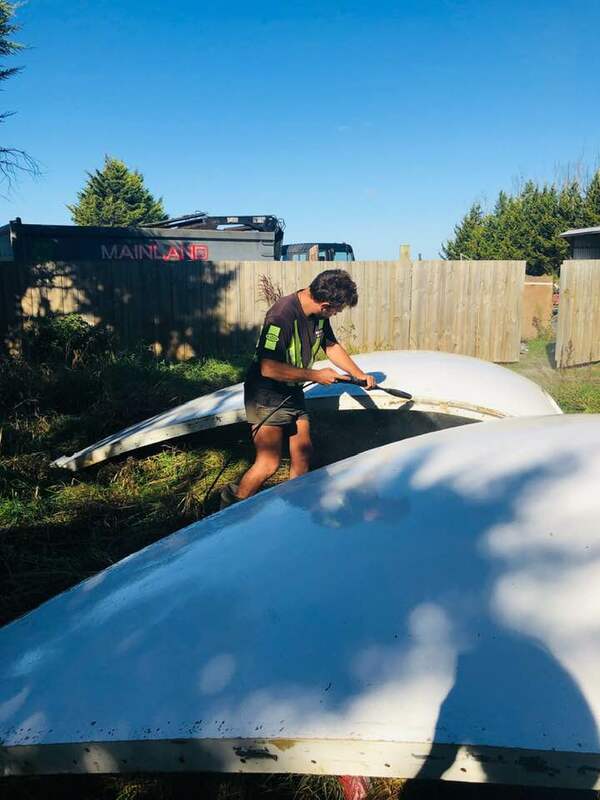 It is a rather exciting time for Futuro restoration efforts; there is the Futuro once in South Africa now being restored by Craig Barnes in the United Kingdom, the Canberra University Futuro being restored by Wade and Jon's team and of course Nick has two Futuros in Rangiora which he is starting to restore. 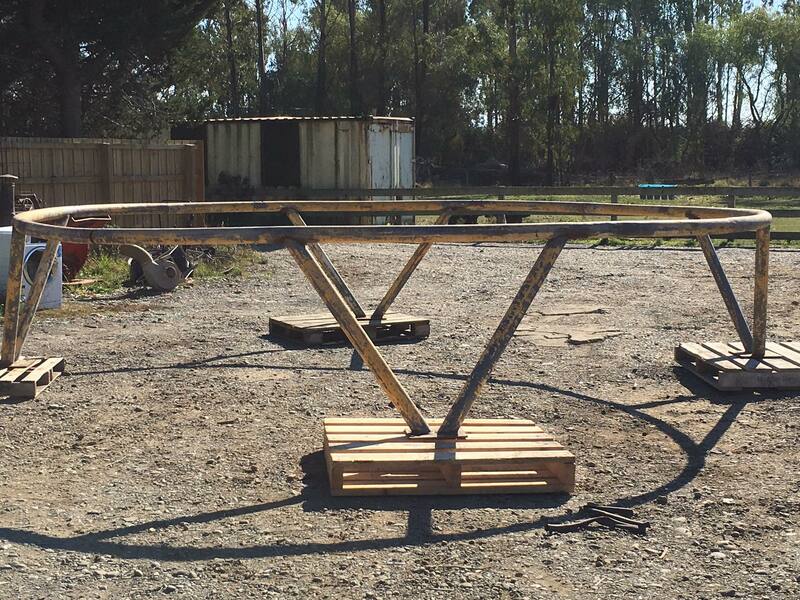 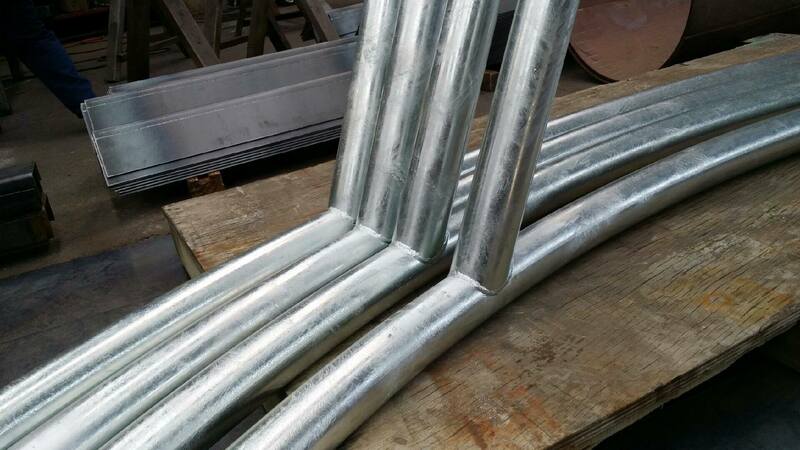 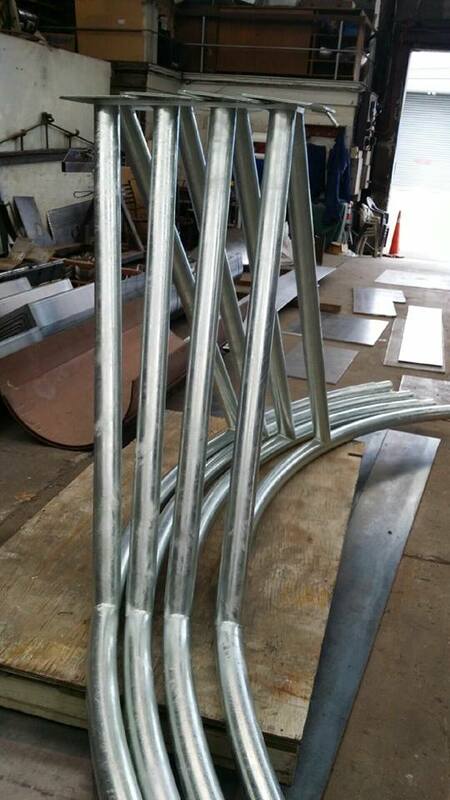 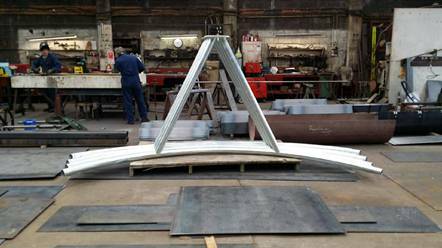 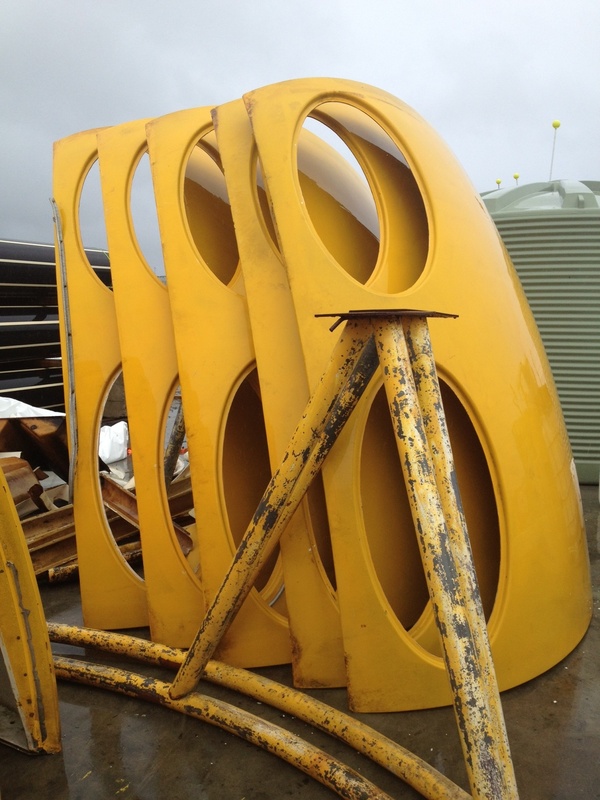 The three new photographs below show newly fabricated support ring sections for one of Nick's Futuros - photos courtesy of Nick. 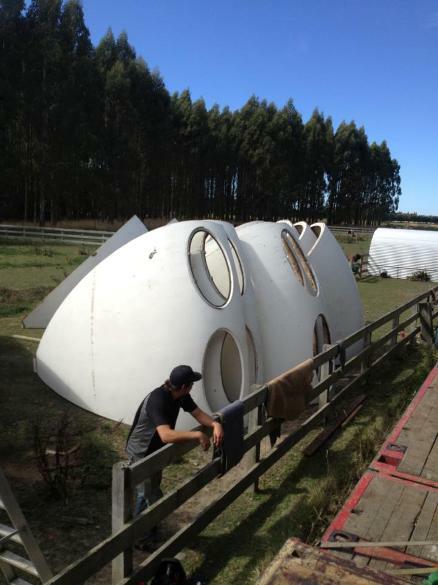 OK so this is not "technically" a Futuro update but since Nick now appears to be the premier Futuro House owner in the world with three [the two listed here and the Raglan Futuro which will be moved to Rangiora in the New Year] and the Venturo is also a Matti Suuronen design I am including this here. 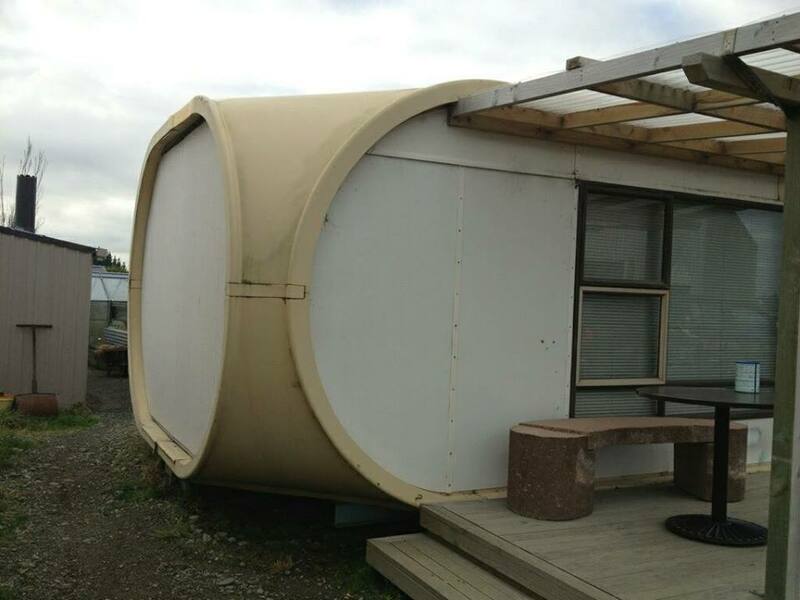 The other day Nick sent me the three photos below which show Nick's Venturo House which will be shipped to Rangiora to join his Futuros in the new year. 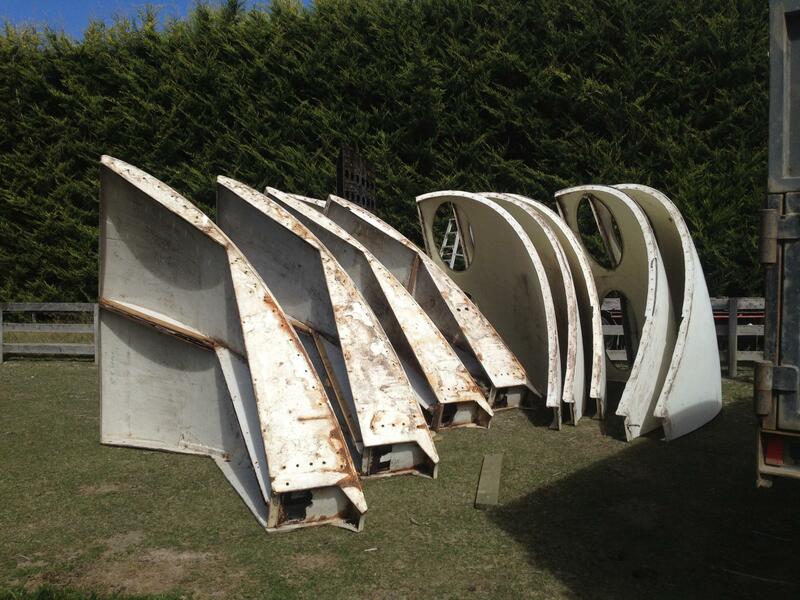 Quite a collection you are amassing there Nick. 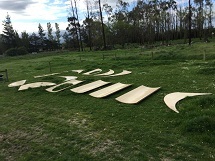 The photos below were posted on Facebook by Nick McQuoid - Nick I hope you do not mind me raiding your Facebook timeline! 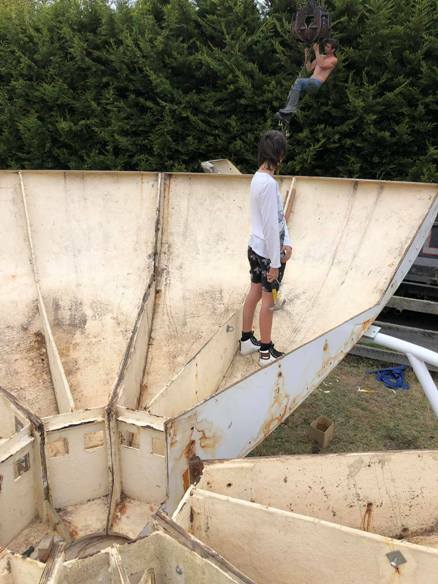 This first photo of Nick atop one of his Futuros in "cleaning mode" does not specify a location but I believe it is the Kaimaumau Futuro prior to disassembly and removal from that site and transport to Rangiora. 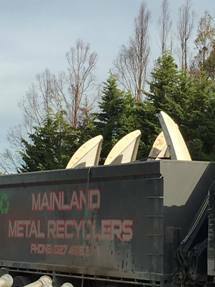 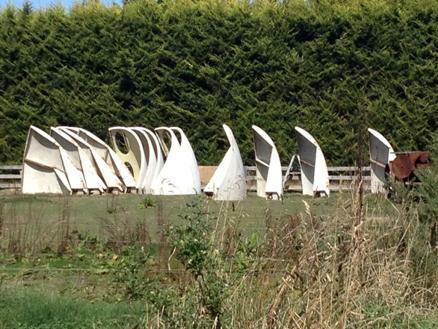 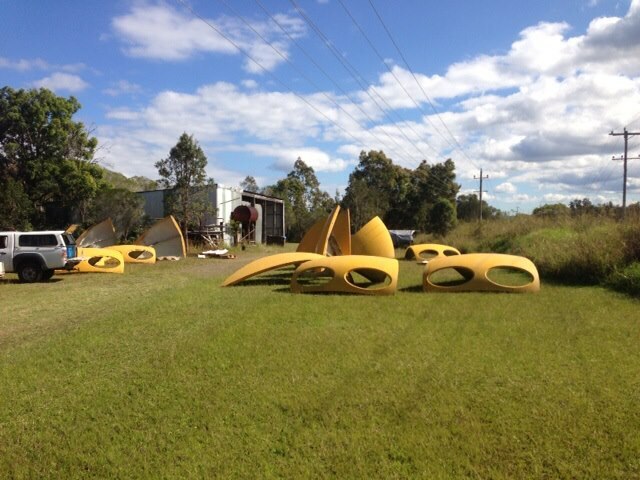 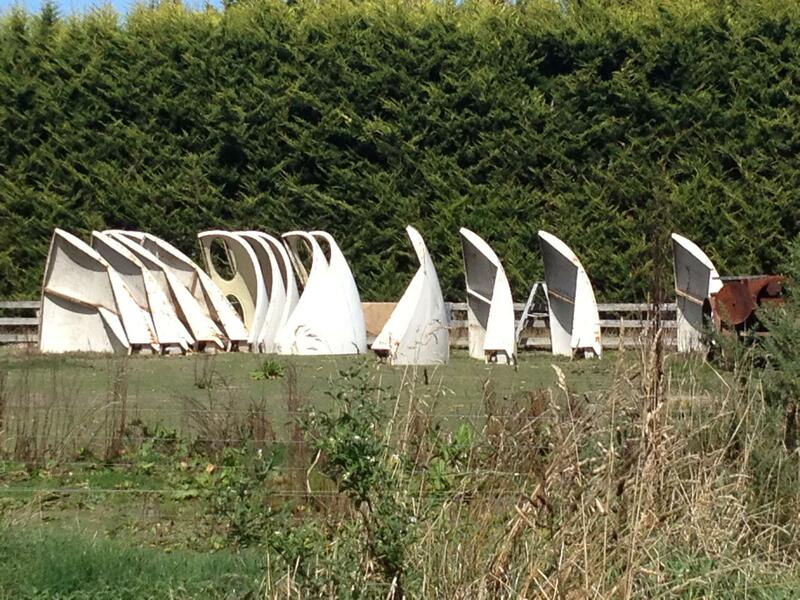 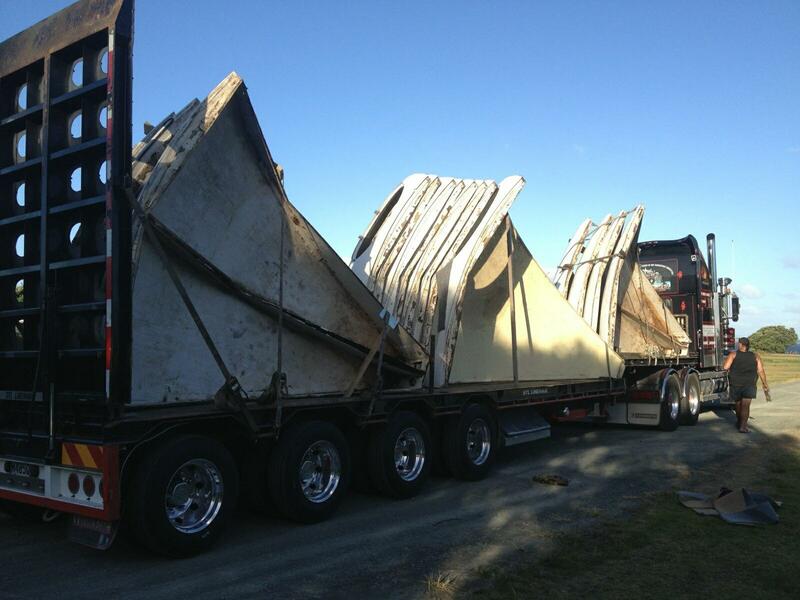 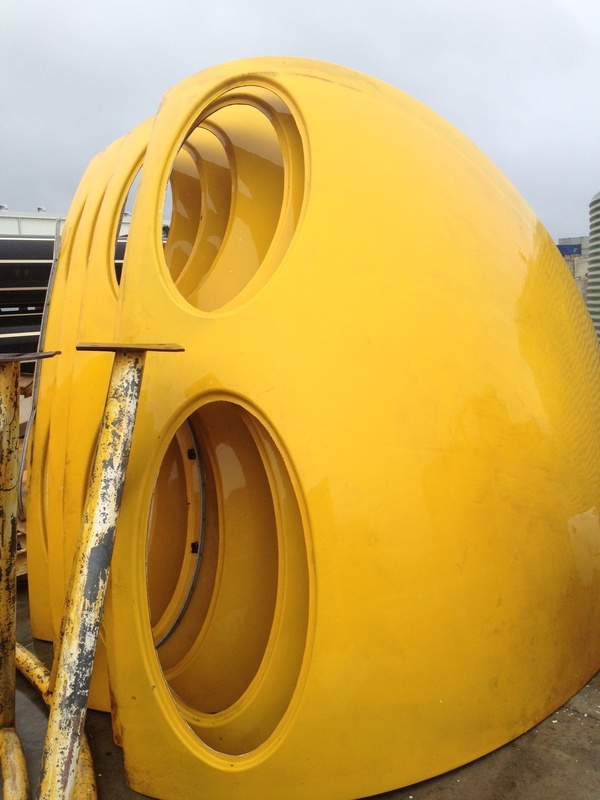 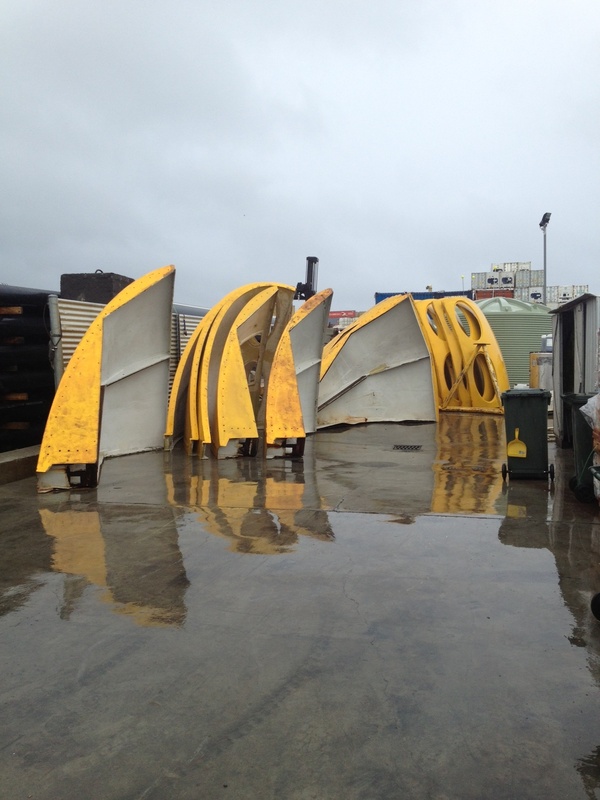 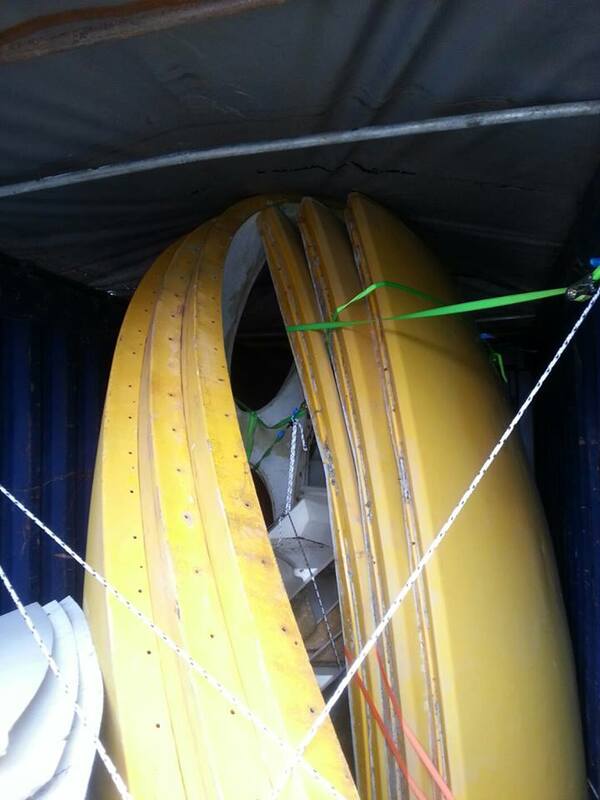 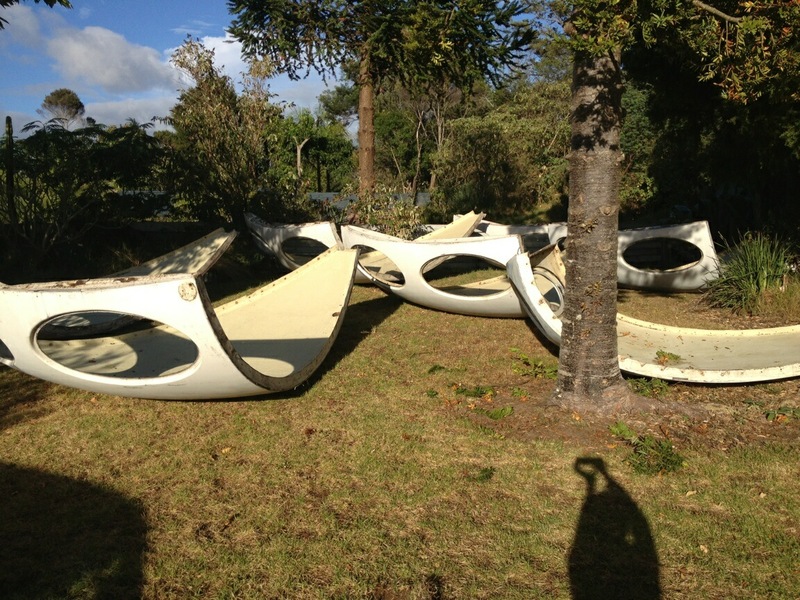 These next two photos show the Kaimaumau Futuro after cleaning and prior to disassembly. 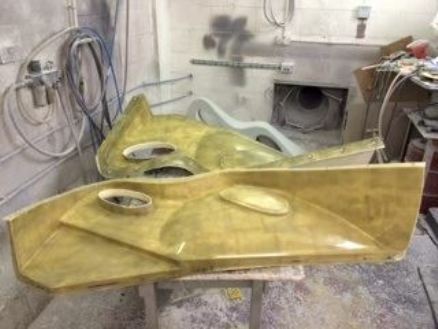 All I can say is what a difference that "elbow grease" made; looks pristine in this shot. The next series of six photos shows the Kaimaumau Futuro after disassembly and loaded on a truck ready to travel to its new home [first two photos] and then unloaded at its destination where it will be stored until it is reassembled and restored [next four photos]. 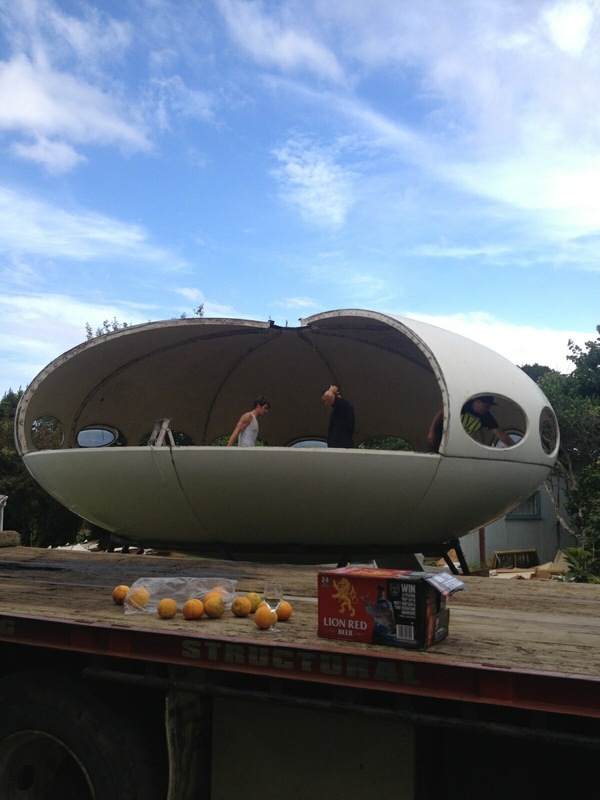 The featured image above and photos the below were sent to me by Nick McQuoid and show the Futuro that was in storage in Australia for many years in a disassembled state on its arrival back in New Zealand. 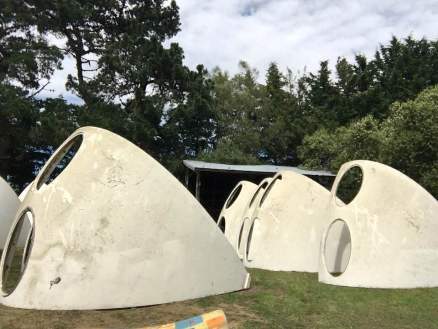 The images below, also from Nick McQuoid show the Kaimaumau Futuro as it was on site and as it appeared during disassembly. For more images of these two Futuros prior to their arrival in Rangiora please see the archived pages on the Kaimaumau Futuro and the Futuro recently purchased by Nick. 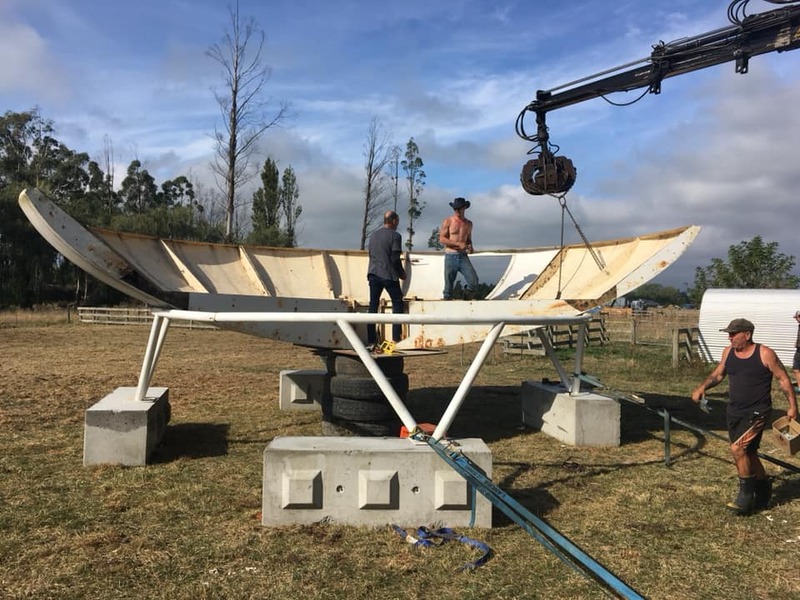 Nick McQuoid could be considered something of a "mover and shaker" in the "Futuro World" and he recently let me know about two more "Futuro transactions/moves" in which he was involved. 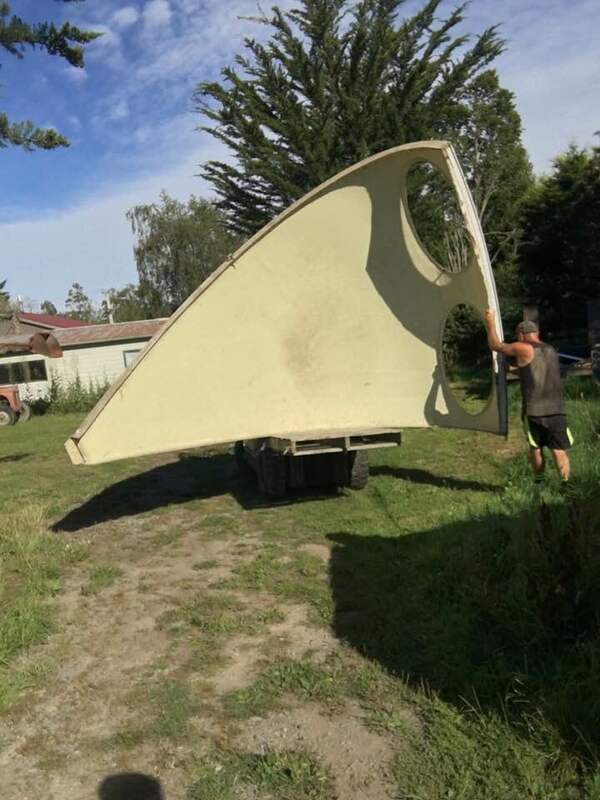 First off Nick has purchased the Paringa River Futuro and it is being moved to Rangiora along with the Futuros he already owns. 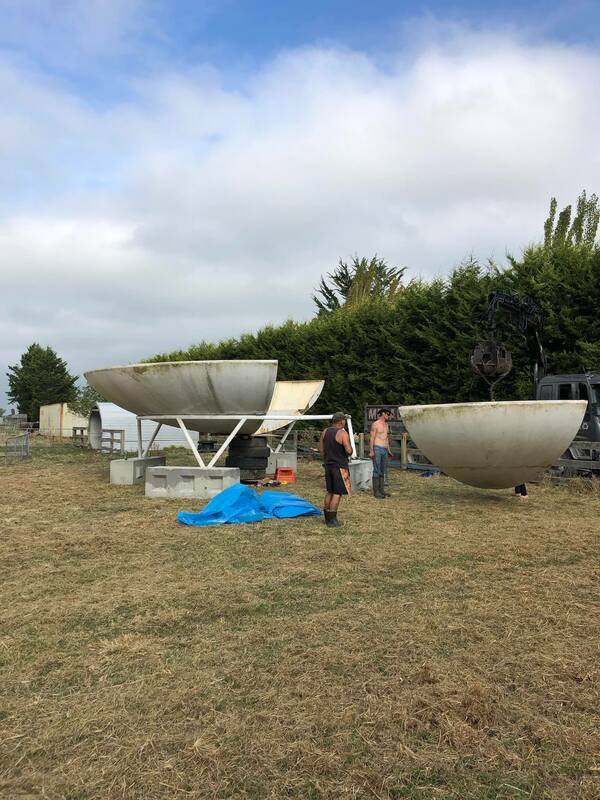 In theory that would bring the count of Futuros in Rangiora to three except that Nick has also recently sold one of his Futuros so Rangiora actually continues to be the home of two Futuros. 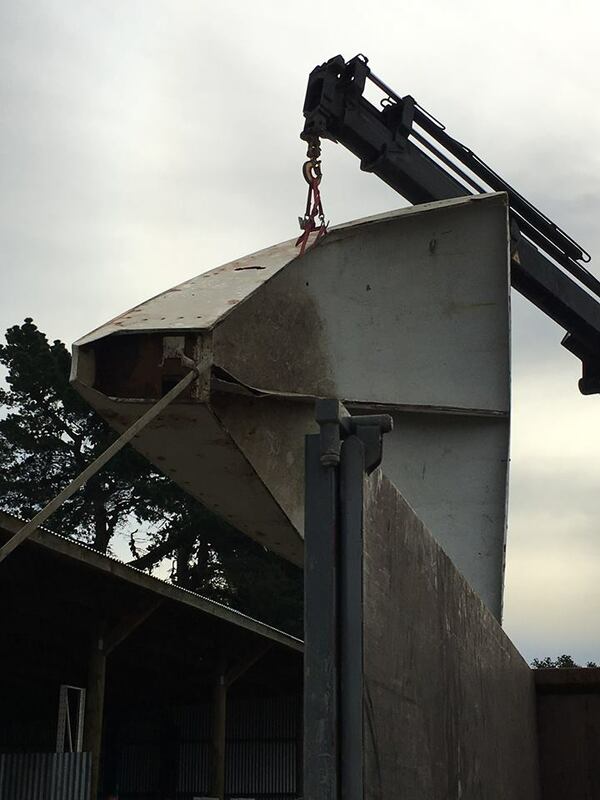 The removal of the Futuro from the remote Paringa River location was an adventure involving land, sea and air; Nick documented the removal in a series of photos and videos that can be found on the Paringa River page. 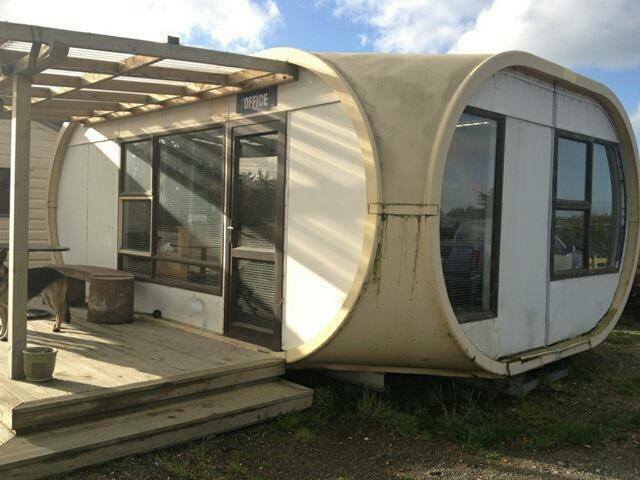 The Futuro Nick purchased and moved from Kaimaumau to Rangiora is the one that has been sold. It has been sold to the Museum Of Old & New Art in Berriedale, Tasmania; a northern suburb of Hobart. 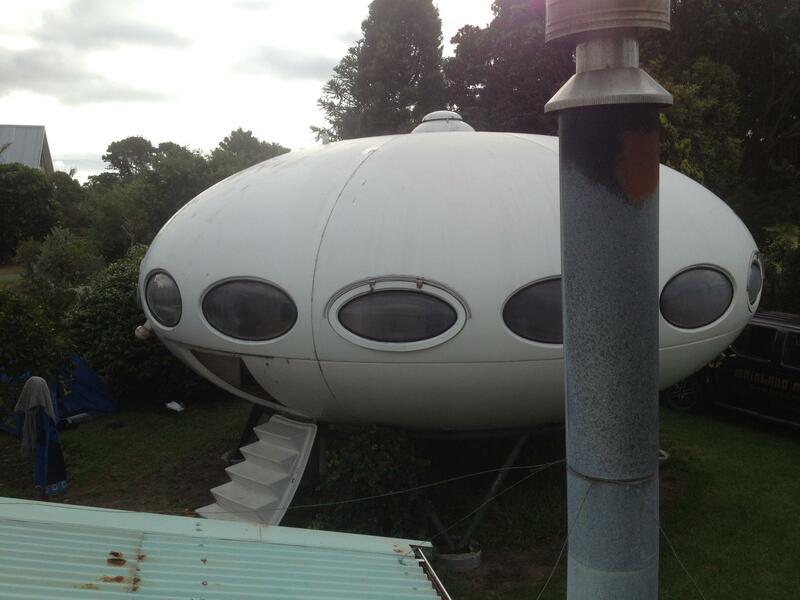 The sale is particularly notable in that, with a sale price of $260K new Zealand dollars [about $175k US dollars at the time of writing], it achieved the highest sale price yet for a Futuro [at least according to my often fallible memory and details I have of sales where I know the sale price - Warrington I think would have gone for more but that was not only a Futuro, it included a home and lot]. While I congratulate Nick for the likes of me with a huge interest in Futuro but a small budget it just seems to make the already remote possibility I might ever manage to buy my own Futuro an even more remote pipe dream! 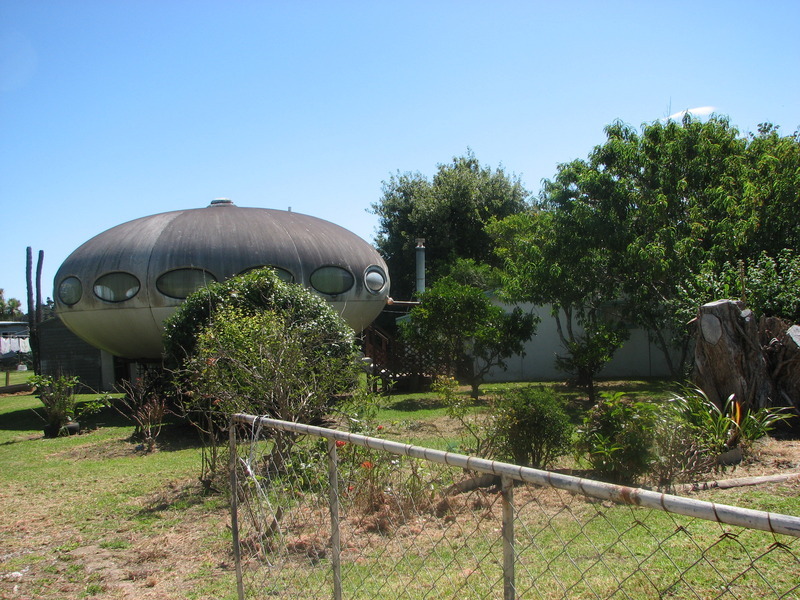 That said it is nice to think that another Futuro is going to be [presumably] preserved and open to the public. 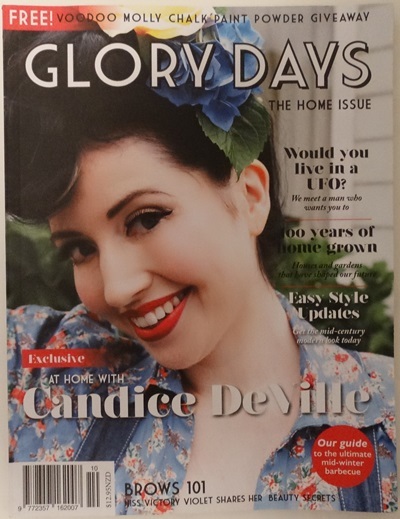 Issue #10, "The Home Issue", of New Zealand vintage lifestyle magazine Glory Days features a nice six page Futuro article. 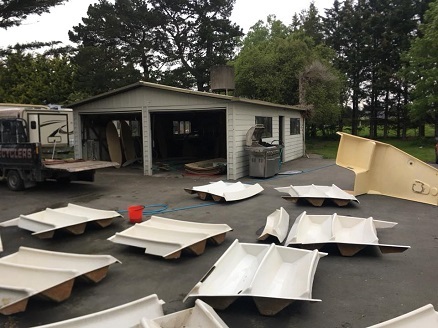 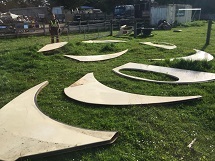 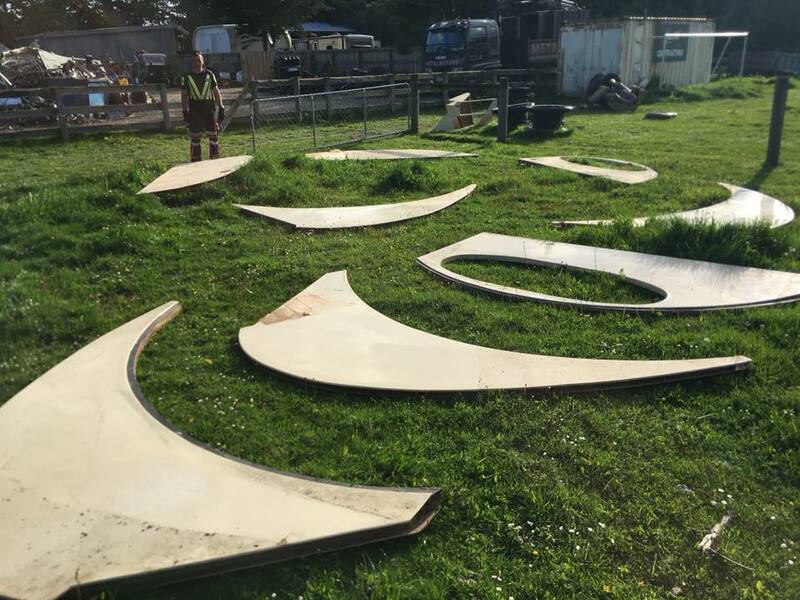 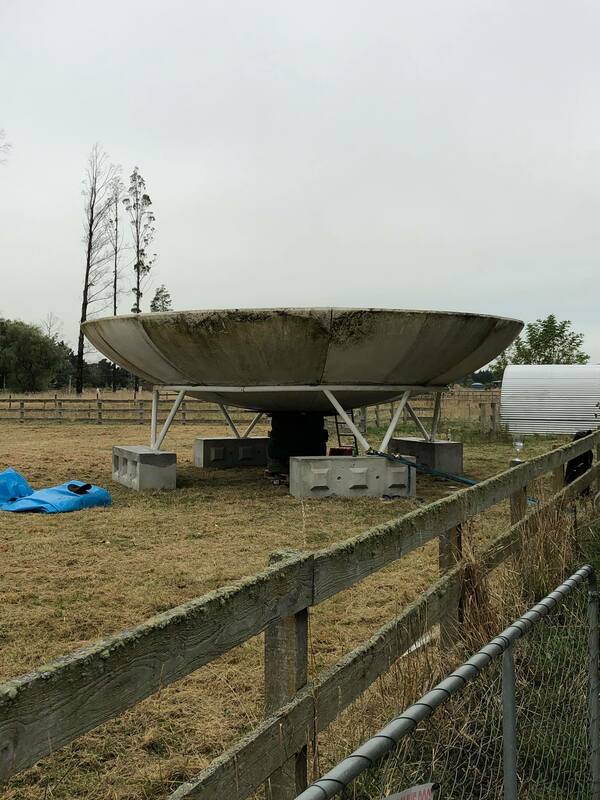 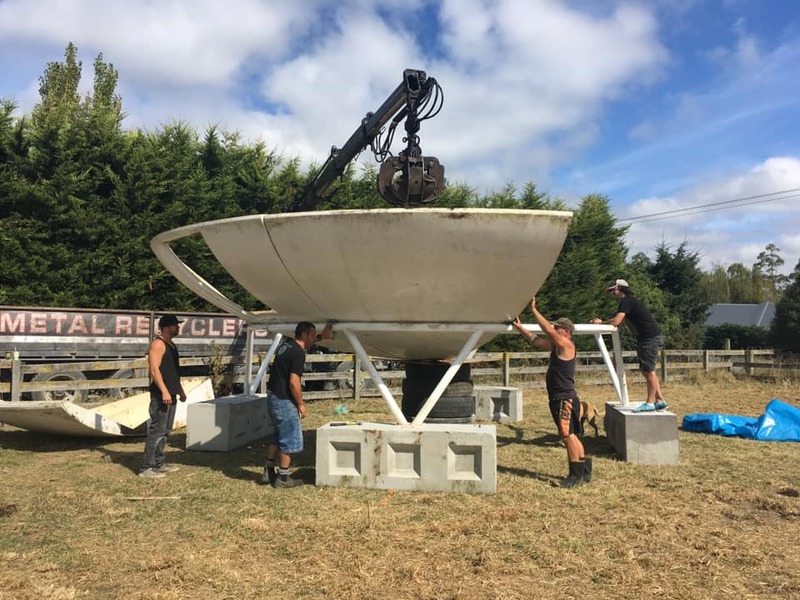 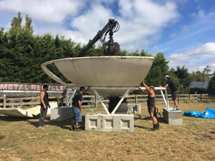 The article focuses on the history of the Futuro, primarily as it relates to New Zealand, and on Nick McQuoid and his pair of Futuros he is in process of restoring in Rangiora. 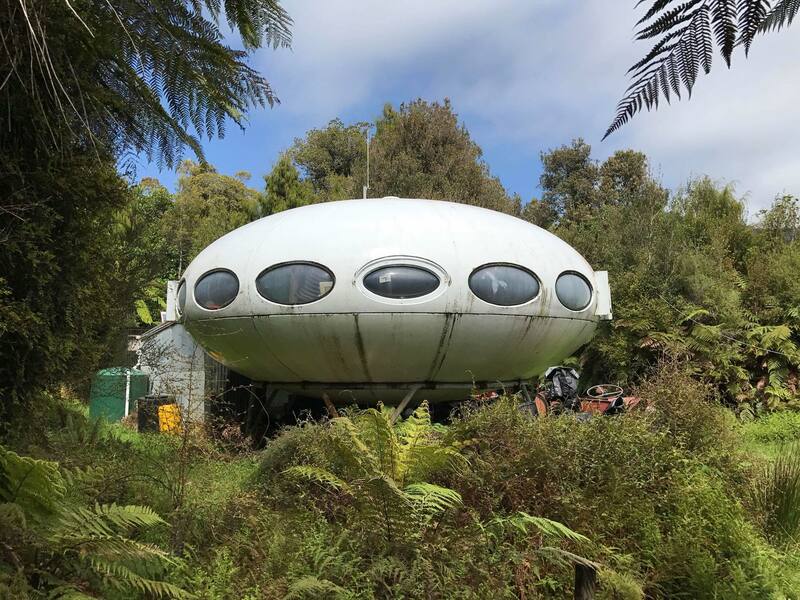 The article was written by Mathilda Wrexham and in it we learn that Nick first came across the Futuro as a child growing up in Christchurch. 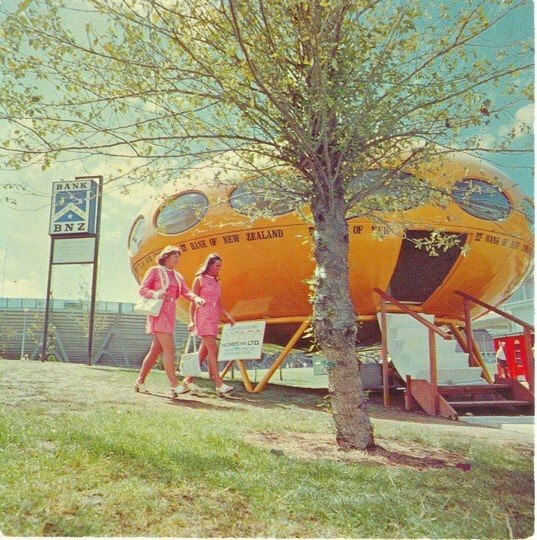 Nick recounts that his parents would often drive past a "flying saucer" in New Brighton on the banks of the Avon River [most likely the Futuro now in Harewood but at the time on Fordingbridge Lane]. 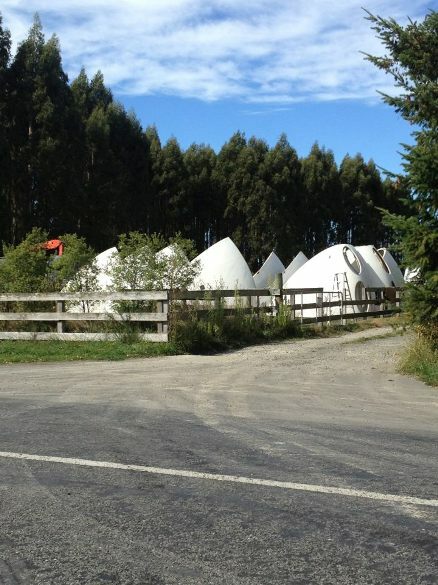 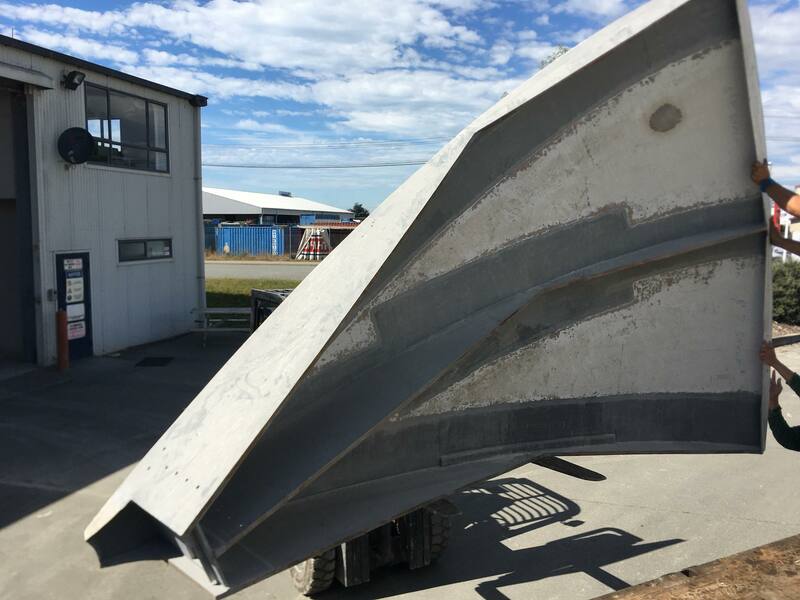 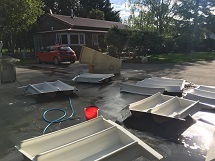 At the time Nick had no idea what the structure actually was but about five years ago he was driving home from Christchurch airport when he happened to glance over into a storage facility for old relocatable housing [Harewood] and saw the same structure. Looking the structure up online when he got home Nick discovered it was a Futuro House. Nick contacted the owners of the storage facility to see if the Futuro might be for sale; it was but he was disappointed to find that the asking price was way out of his range at $260K. 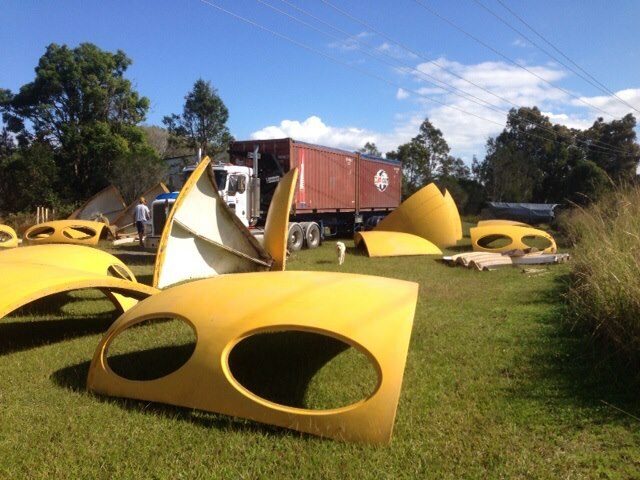 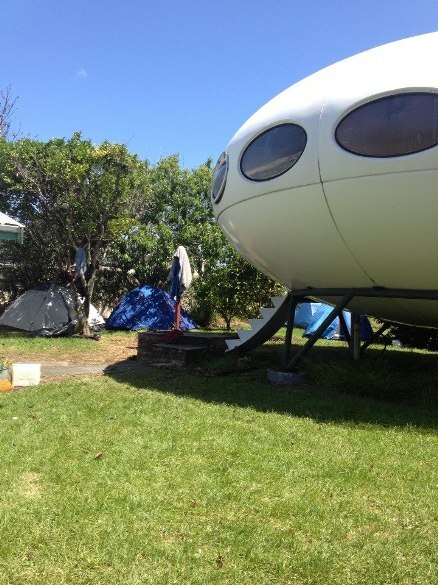 Nick however was not discouraged and he continued to research the Futuro House and one day he saw a sale listing for the Kaimaumau Futuro. 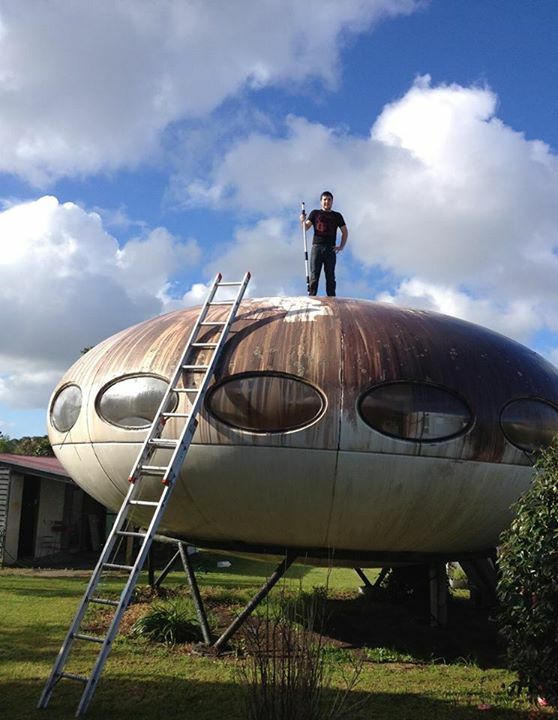 Wasting no time Nick contacted the agent to book a viewing and flew north to see the Futuro the very next day. 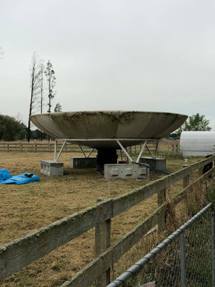 The unit had been on site since the early 70's [likely its only location to that point] and had been occupied by the female owner until she passed a few years prior. Nick signed on the spot and, being unable to use the Futuro at its existing location, decided to move it to Christchurch. 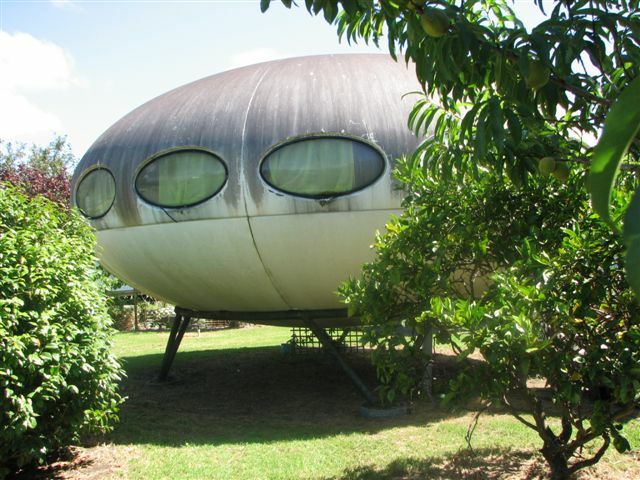 Around the same time, and during the course of his research into the Futuro Nick had made contact with Paul McNeil [Paul wrote the Australia and New Zealand sections of the Home and Taanila edited Futuro book Futuro: Tomorrow's House from Yesterday]. 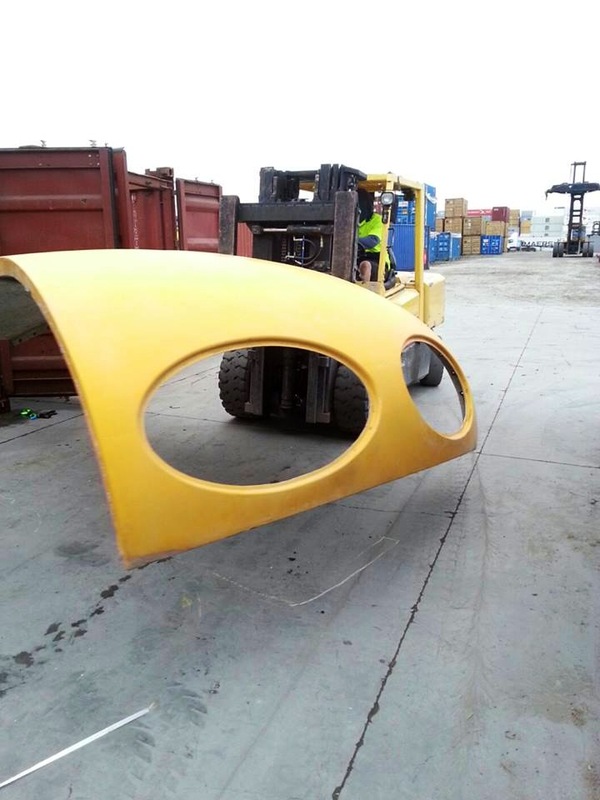 McNeil had purchased a Futuro in Christchurch in 1996 which he had shipped to Sydney but he had never gotten around to restoring it and it was in storage. 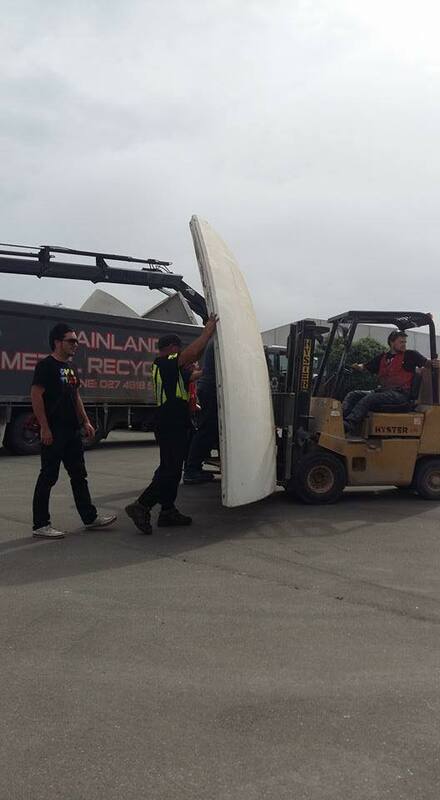 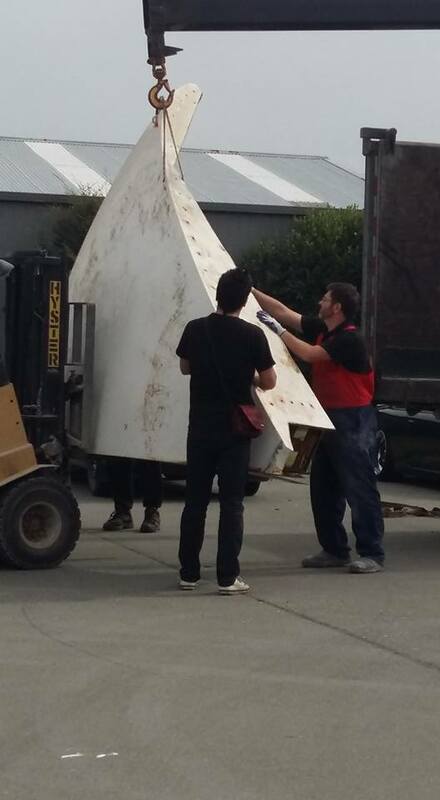 Paul agreed to sell the Futuro to Nick and it was shipped back to Christchurch. 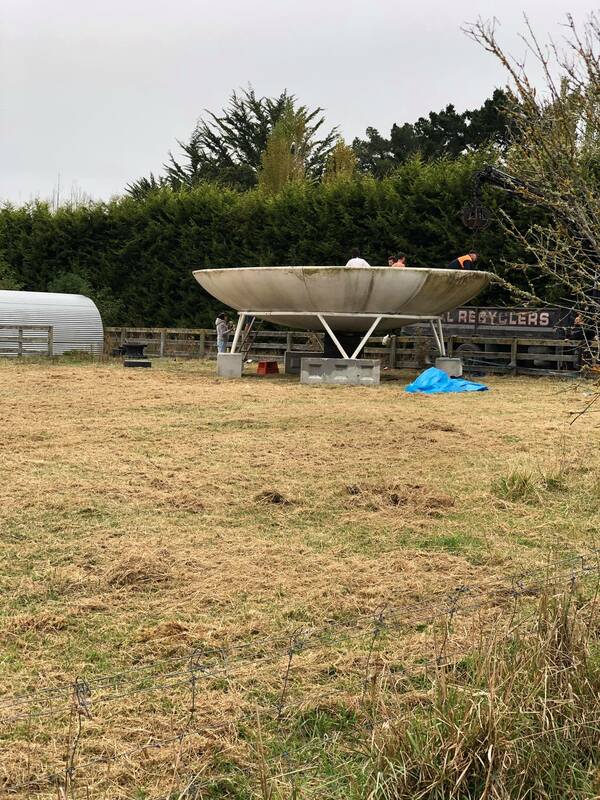 This Futuro was one of the ones used in Christchurch at the 1974 British Commonwealth Games by the Bank Of New Zealand [info here] and Nick felt like he had "brought the Futuro back home". Nick's two Futuros are currently in process of restoration in Rangiora [along with another Suuronen building; a CF-45 Venturo]. 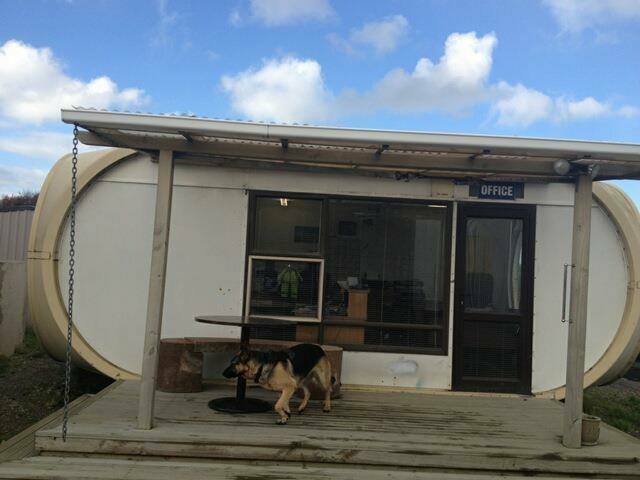 Once renovation is completed Nick plans to use the units as accommodation for locals and international visitors. 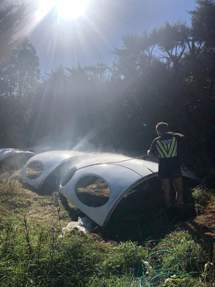 Not sure I will ever be able to do it but I do hope to make a trip to Australia and New Zealand one day; guess where I will be looking to stay if I ever get to new Zealand. 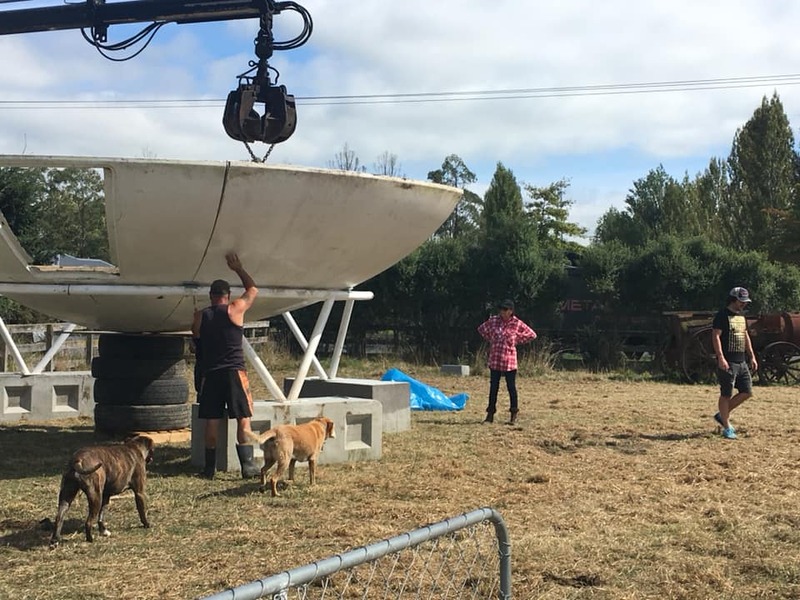 I am looking forward eagerly to seeing how Nick's renovations turn out. 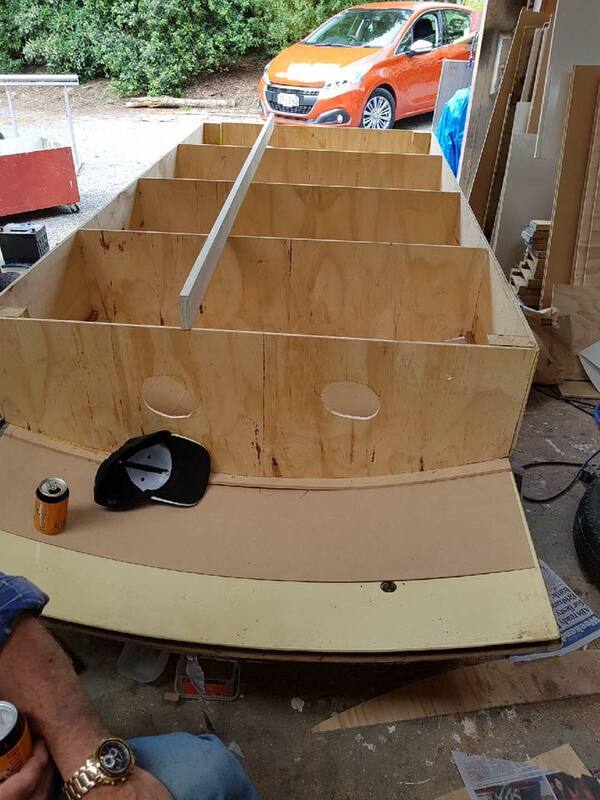 It seems Nick is making some good progress on his restoration project. The photos at right from Nick's Facebook Page illustrate the mold Nick has manufactured for making the armrest units that sit between each chair/bed unit and also the first unit made using the mold. That first unit looks pretty good based on the photo but Nick indicates in the comment that accompanies the photo that it needs a little tweaking to be perfect. 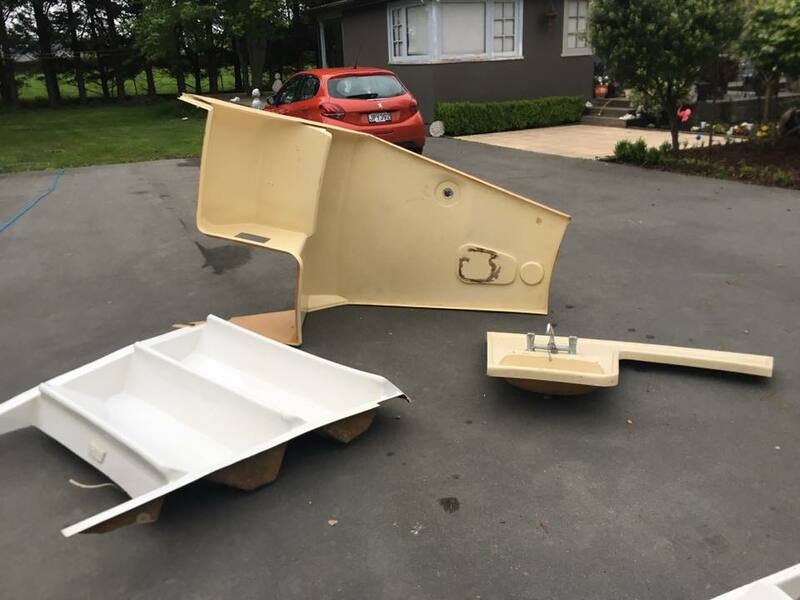 Nick is clearly planning on giving at least one of his Futuros a European flavor since the Australian and New Zealand units did not feature the set of chair/bed units seen in the European Futuros. In mid 2012 after searching for some time Nick McQuoid purchased the Kaimaumau Futuro. 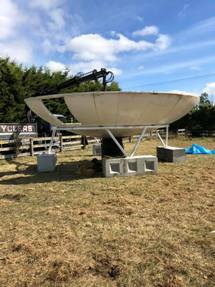 In 2013 Nick found a second Futuro in storage in Australia and purchased that one and shipped it back to new Zealand [this was the unit displayed at the 1974 Commonwealth Games in Christchurch, New Zealand]. 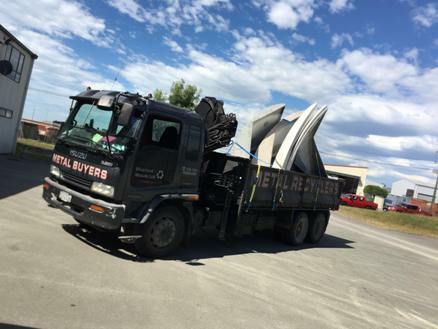 Nick tells me both Futuros are now in Rangiora, a town some 30 km or so north of Christchurch, New Zealand. For more information, history and photos on these two Futuros prior to their arrival in Rangiora please see the archived pages on the Kaimaumau Futuro and the Futuro recently purchased by Nick. 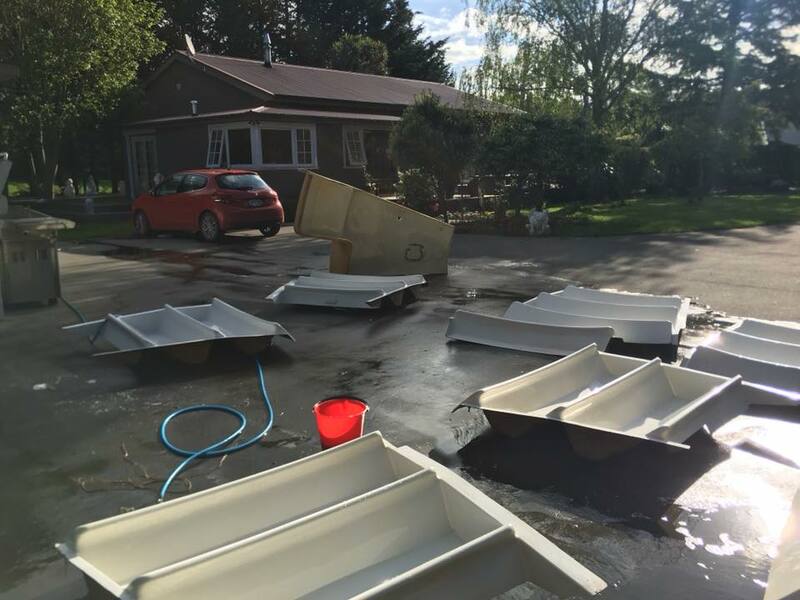 These photos posted to Facebook 032319 by owner Nick McQuoid.